Phonics is a tested-and-proven method of teaching a child (or even an adult) to capably read and write in the English language. It involves introducing your child to the sounds of every alphabet in the English language through a fun phonetic song. Gradually, your child learns how to read and write new words through sounding out phonograms and blending them together. These techniques help to equip your child with simple yet powerful tools that profoundly improves his/her reading. 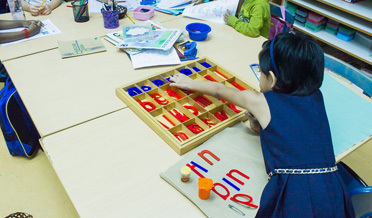 The Montessori method of teaching Phonics was developed by Dr Maria Montessori over a century ago. She carefully curated a Phonics curriculum based on specialised educational materials from scientific observations of children’s learning abilities. Only a qualified teacher who is trained in the Montessori method can effectively execute or supervise a learning session involving the use of these novel materials. This child-centric approach tremendously helps your child to easily comprehend and grasp the learning of Phonics. 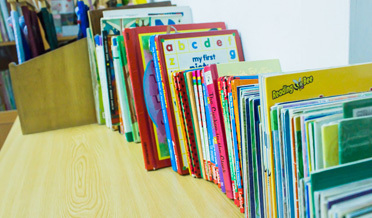 Here at Buzzing Bees Montessori, we have included reading as part of our curriculum in which your child reads a specific set of reading materials for each lesson. The reading materials are structured in such a way that is aimed at progressively refining and improving your child’s reading. Under the thoughtful guidance of our teachers, the reading allows your child to put into practice and strengthen the knowledge he/she gained from the Montessori Phonics curriculum. Consequently, you ought to see a marked improvement in your child’s reading. 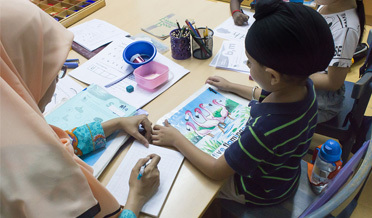 Our Montessori Phonics & Reading course is headed by our principal teacher who is qualified with a Modern Montessori International (MMI) Diploma. She has had over 19 years of experience in teaching children the Montessori Phonics and Reading syllabus. 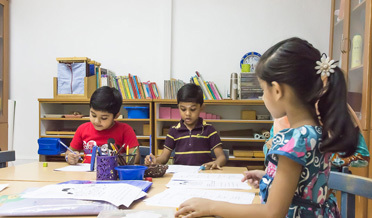 A highly trained and experienced Montessori teacher has the aptitude to keenly observe your child’s strengths and weaknesses when he or she learns the English language. 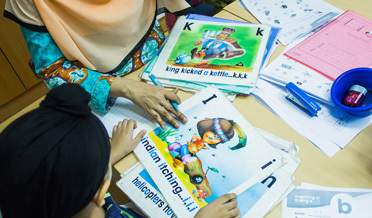 We pay close attention to your child’s development and actively work on sharpening his or her proficiency in English. Our goal is for your child to achieve his or her potential and expand his or her capacity beyond horizons. Our classroom is thoughtfully set to enhance the learning environment for your child. Tables and chairs are low to ensure that your child is not distracted by discomfort while doing his or her work. The setting of the tables and chairs are in an arrangement that allows the teacher to pay attention to your child although he or she might be attending to another student. The surrounding areas are clear to ensure free movement for your child when he or she approaches the teacher, goes to the toilet, or is given a play break. Such conveniences are subtle yet necessary for an enriching learning experience. We are more than well-stocked with all the essential materials that your child would require in going through the Montessori Phonics and Reading syllabus. The materials are routinely upgraded or changed as we strive towards continuous improvement in our learning methods and instruction. Your child would not be alone in the classroom for his or her lessons. We always have a varied mix of students from vastly different backgrounds, cultures, and traditions learning at the same time. This diversity also helps your child to grasp useful soft skills by being exposed to a variety of interactions. We ensure that each child develops good relationships with others by encouraging universally ideal values such as caring for one another. For over 16 years, we have taught and nurtured countless students to become great readers and wholesome individuals. Numerous students have come to us with limited reading abilities only to graduate from the programme with a marked improvement. As the flagship programme for Buzzing Bees Montessori, our Montessori Phonics and Reading course is unrivalled in the results that it has produced thus far.